Specialty Lines of Business: Life, Living Benefits, Mutual Funds, Private Wealth Management, Annuities, Guaranteed Interest Contracts, High Interest Savings Accounts, Mortgages & Investment Loans, Group Life, Health, Disability & Retirement, Travel Insurance, Creditor Insurance, International Employee Benefits Management. Manulife Financial, similar to other Canadian life insurance companies, offers numerous products targeting clients with various insurance needs. Though LSM Insurance is not directly affiliated to this insurer, our experienced life insurance brokers have access to products and quotes of over 20 Canadian insurers similar to the ones provided by Manulife Financial such as term life insurance quote, whole life insurance quote, universal life insurance quote, disability insurance quote, critical illness insurance quote, no medical life insurance quote, long-term care insurance quote, group benefits and others. Manulife Financial’s disability insurance lineup has five products. Their Proguard Series is geared toward professionals. This is their flagship policy, and includes many built-in features. The plan has elimination periods from 30 days to 2 years. Benefit periods range from 2 years, 5 years and to age 65. The insured’s benefit can range from $200 to $24,500 a month. The Proguard plan also offers a whole host of riders, including a cost of living rider to keep in line with inflation; a specific occupation rider for specialized occupations such as surgeons; and variety of return of premium riders that allow the insured to receive some of their premium back for staying healthy. Another of Manulife’s disability plans is the Venture Series—a lower cost disability plan which fits the needs of all types of occupations. The Venture plan has less standard features than the Proguard series, but is available for full-time and part-time workers. The ExpenseComp plan reimburses office overhead expenses for a small business or professional practice during disability. This plan has a maximum benefit period of 24 months. Manulife’s Buy-Sell Plus provides funds for the healthy owners of a partnership or small business to buy out the shares of a disabled partner. The plan is unlike traditional disability coverage in that it pays out a lump sum rather than a monthly benefit. Lastly, Manulife has a personal accident plan available for the blue-collar worker or the difficult to insure. Rating of Manulife Financial policies from independent insurance expert Lorne S. Marr. Are Homeowners Properly Insuring Their Increasing Debt Loads? Why Are Whole Life Insurance Rates and Universal Life Rates Increasing in Canada? What Type of Disability Insurance Should a Doctor Buy? Who Hasn’t Raised Their Universal Life Rates? Critical Illness Providers: LSM’s Andrew Burdi Discusses the Secret Benefits. Non-Medical Life Insurance: Should I Buy Direct or Through a Broker? LSM Insurance is an independent Life Insurance Brokerage and is Not Directly Affiliated to Manulife Financial | Manulife Life Insurance. 1. They offer preferred rates on both their term and permanent policies. 2. Very competitively priced term and universal life plans. 1. They do not have term policies longer than 20 years, except for their Term 100 plan. 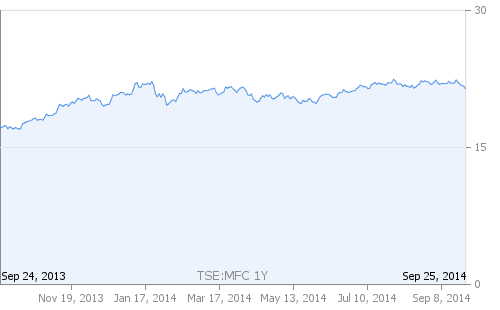 1 year stock chart for Manulife Financial Corp. 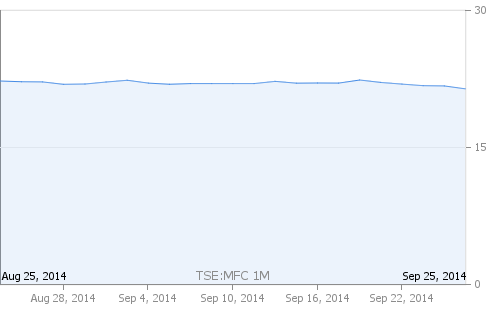 The above stock charts are for the parent company, Manulife Financial Corp. of which Manulife Financial is a subsidiary. These stock charts are for informational use only and are meant to reflect the current financial well-being of the parent company.